DemRats or – the Party of Molech! The pagan god Molech, known as the god of fire, had as his mission, according to its deluded followers, the destruction of children, especially babies. And they would be destroyed in the cruelest possible way…being burned to death. The DemRats of today, have the same insane mission while worshipping their god, Abortion, and dispatch developing babies who feel pain, by ripping off their limbs, one by one, then the head, as the tiny babies silently scream in agony. Again, THEY HAVE FEELINGS! Don’t forget that. What is worse, these Demon Craps appear to DESIRE that inconvenient babies be made to suffer as much as possible while “getting them out of the way.” After all, who wants to be tied down, restricted from their sick satisfaction by having to care for inconvenient babies? And these Dem Rat BASTARDS stood in the way of that compassionate bill being passed. Now don’t get your knickers in a twist by the choice of a particularly descriptive word. That word is biblical and used in The Bible to question details of certain births. Molech was the god of the Ammonites. Many of Solomons’ concubines were Ammonites. Many Israelites considered this imagined “god” a “King.” The image was made of brass, though hollow inside…exactly like the Democrats of today. The idea of Molech, the god of fire, was for purification of the people by fire. According to legend, the seeds of human kinds are the best to sacrifice. In Acts 7:43, Stephen indicated that this Molach sickness was wider spread than suspected. Indeed it seems to be active right up to this present day thanks to the Democrats. By the way, the last years that the Democrat Party was good was when John K. Kennedy was president. It was after he was assassinated that the Communists came front and center in their effort to make….”a whole new world.” Then the ultimate victory for Communist Party USA (CPUSA) when they managed to shoe-horn Obama into the Oval Office. And they ALMOST won. Except that Donald Trump came galloping in. And why tie them to Molech? 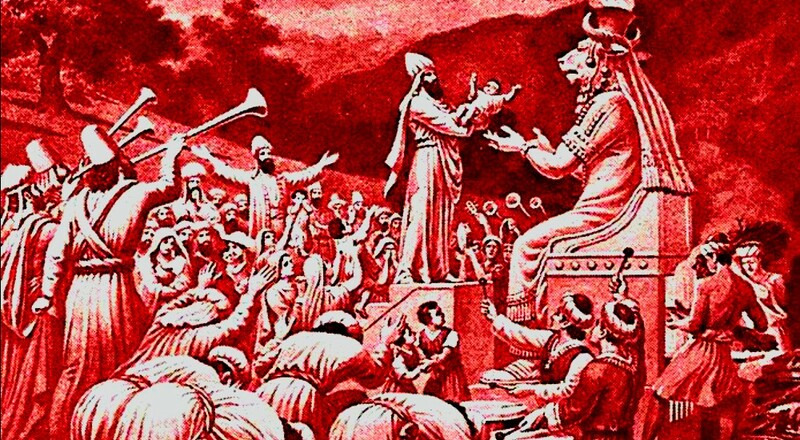 When little living babies were brought to Molech’s altar to be sacrificed by burning them alive, there were drummers and musicians in the area playing loudly to drown out the screams of the babies and children. We cannot allow this to go on. Never, ever vote for a demoncrat again! When one looks at the strained faces of Nancy Pelosi and Alexandra OCrazy Cruz, and other demon rat faces, think rationally and never ever vote for one of them again. And let’s reopen mental state hospitals. Spike Lee's Disservice to Black AmericaIs This the Swan Song of the Electoral College?